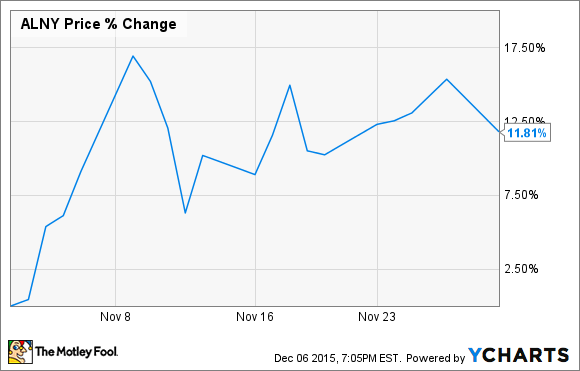 Alnylam Pharmaceuticals' Stock Picked Up Steam in November: Any Upside Remaining? A clinical update for Alnylam Pharmaceuticals' lead clinical product drove the drugmaker's shares higher last month. What: According to data provided by S&P Capital IQ, shares of Alnylam Pharmaceuticals (NASDAQ:ALNY), a rare disease and RNAi therapeutics specialist, gained nearly 12% in November. The apparent catalyst behind Alnylam's strong month was a clinical update provided by management during the drugmaker's third-quarter earnings report. Specifically, management noted that the late-stage study dubbed "APOLLO" assessing the experimental therapy patisiran as a potential treatment for the rare but fatal neurodegenerative disease known as Familial Amyloidotic Polyneuropathy, or FAP, is close to completing enrollment. Perhaps most significantly, the company thinks this pivotal trial could lead to a New Drug Application for patisiran by 2017. So what: With Pfizer's (NYSE:PFE) EU-approved FAP treatment Vyndaqel in mind, some analysts covering this stock have suggested that patisiran could generate somewhere around $800 million in peak sales, if approved. In light of the fact that Alnylam only generated a little over $57 million in revenue in the past 12 months and the company sports a market cap in excess of $8 billion, the market's clearly banking on patisiran's approval going forward. Now what: Based on patisiran's encouraging midstage results, analysts have pegged the drug's probability of success in this ongoing late-stage trial at around 80%. The market seems to agree with this optimistic outlook based on the company's noteworthy market cap. Having said that, I think investors may want to consider the possibility that this enthusiasm might be emanating, to some degree, from the fact that FAP is a fatal orphan indication. In short, investors often assume, sometimes incorrectly so, that drugs for these types of deadly conditions will face an easier review process from the FDA than more traditional drugs. Pfizer's Vyndaqel, though, provides a powerful counterexample to this broadly held notion. Although the EU approved Vyndaqel, the FDA decided not to follow suit, asking the drugmaker for additional data on the drug's efficacy profile. That's not to say that patisiran is destined to run into the same problems. After all, its midstage results have been truly impressive -- which is perhaps the main reason for the market's rosy outlook. Nevertheless, I think it's always a good idea to exercise caution when the market is clearly building in future revenues for an experimental product, regardless of the drug's emerging clinical profile.